Biography: La Farge was one of the most significant innovators in the history of American stained glass. In addition to his contributions to stained glass, La Farge's innovations in mural painting, Japanese-inspired watercolor and his decorative art collaborations with architects and other artists distinguished him as a man of multiple talents. La Farge also lectured and wrote prolifically on the subject of art, and is known for his friendships with many artists and intellectuals of his day. His contributions to stained glass technique include: The development and use of opalescent glass, which he first patented in 1880; incorporating molded glass embellishments into his creations, usually in the shapes of jewels or flowers; and plating, the layering of glass pieces directly on top of each other to achieve detailed depth and minimize the need for painting. There is some misunderstanding as to the extent of John La Farge's legacy in the medium of stained glass. 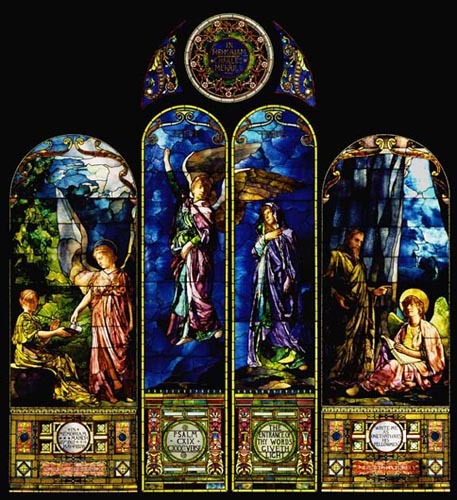 Although La Farge was widely acknowledged in his time for his contributions to stained glass, many people today know little of La Farge and typically recognize the more prolific Louis Comfort Tiffany as the primary innovator in American stained glass. The two artists were contemporaries and later bitter rivals, simultaneously experimenting with the stained glass techniques that would revitalize and revolutionize the art form. The aim of the Michigan Stained Glass Census is not to privilege one artist or studio over another, but to acknowledge all of their contributions to the art form, and to Michigan's cultural heritage. University of Connecticut Masters Thesis. Matthew Bowman, May 2014. John La Farge's Stained Glass Windows at the Thomas Crane Memorial Library: Old Philosopher, Alpha, Omega. (paper 562) http://digitalcommons.uconn.edu/cgi/viewcontent.cgi?article=1668&context=gs_theses.